A page from Explorers on the Moon, possibly the most famous of Hergé’s Adventures of Tintin, has just sold for a record 1.55 million Euros at a Paris auction. 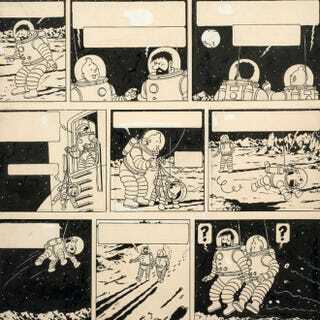 The artwork appeared in the 1954 album (although I presume it was drawn the previous year for serialised publication in Tintin magazine) and shows the Belgian reporter, his pal Captain Haddock and pet Milou (Snowy) on the surface of the Moon. That’s 1.64 million dollars or 1.33 million pounds.